I don’t really know where to start with this one. It’s a very well written novel, but I struggled to see where it was going, what it was focusing on. With a title like Dollbaby, I expected the novel to infact be about the character Dollbaby, but it’s not. Instead, the novel centers around Ibby, a young white girl thrust into a life in New Orleans with her eccentric grandmother, Fannie. As Ibby attempts to navigate life and her feelings of abandonment, she comes to rely on the help, both Queenie and Dollbaby, to understand her grandmother’s past and to begin to live for her future, but the novel didn’t seem, at least to me, to have a precise direction. It’s the 1960s, and the civil rights movement is in full swing, but the novel isn’t really about that, and it’s not really about Fannie, or Ibby’s coming of age, even. Truthfully, I had a hard time pinpointing the purpose of the novel as I read. 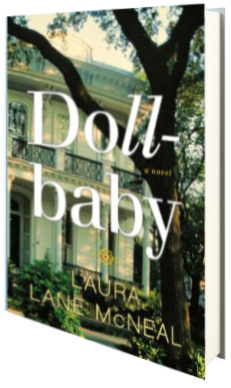 It moves slowly along, like I’d expect life in the South to move, and while vivid and, as I said, very well written, I just couldn’t get over the fact that the novel is called Dollbaby, and Dollbaby is indeed a secondary character who doesn’t drive the plot. She is occasionally thrown in as attending a demonstration or consoling Ibby, but that’s about it. In truth, I found that not much drives the plot line of this story—I guess it’s more of a coming of age story of sorts in which readers learn about Ibby as she grows up in New Orleans, putting together the pieces of her family and edging into the sad and dark secrets kept by those around her. But, I wouldn’t even say the novel is about those secrets, either. I just felt like this was a historical fiction story with snippets of happenings here and there thrown in. I never grew attached to any of the characters, and while parts were interesting in their own right, I have to say the novel on the whole just isn’t my style. While the end brought everything together in terms of the title, characters, and even a few events, something I’d been looking for the entire time I read, it was too late in the storyline to really hit home with me. Had the novel moved faster and tied together events in a way that made sense to me, I think I would have enjoyed it more. As is, it’s just too slow a pace for my tastes. I think someone who really enjoys historical fiction might like this novel, perhaps. Two and a half stars, for me, though. I received an ARC of this novel from the publisher, via Edelweiss, in exchange for an honest review. This title releases today.